Recently I was chatting with a friend and prayer journaling came up. 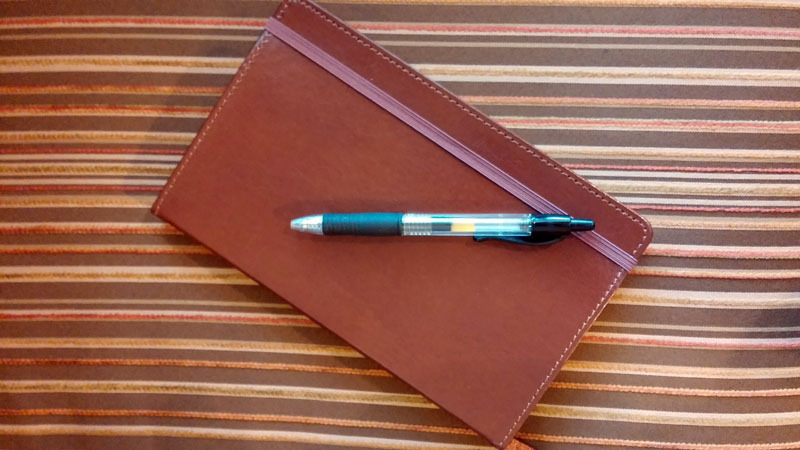 This is my journal – and this is as close as you’ll get to seeing what’s inside! This is just between God and me. I keep a prayer journal, but I also sometimes think or speak my prayers. And, I must say that when it comes to confessing sin – thinking my prayers is by far the easiest! When I think my prayers, after the thought is complete, the issue is closed. For example, if the Holy Spirit convicts me of a sin, I can almost painlessly think, “Oh, man, I shouldn’t have done/said/thought that. God please forgive me.” There. Confessed. Forgiven. Done. It’s almost like I’m a generic sinner confessing my generic sin. Of course, there are times when thinking a prayer is the best option! In the heat of a difficult moment, conversation, confrontation, presentation, panic, or emergency, the “arrow prayer” shot straight up to God from my heart through my thoughts is the best way to unleash God’s power in the moment. I also speak my prayers. Speaking my prayers of confession helps me to focus on God instead of the million things that could distract me. Speaking enables me to go a little deeper with God, to pour out my thoughts, feelings, my weaknesses, why I did what I did. It causes me to be a bit more introspective. When I speak with God my prayers are like a conversation with a friend. I know that I am forgiven and my appreciation for God’s grace grows. But then, there’s writing my prayers of confession. Have you ever written down your sin? It is not easy! My friend said, “When you write your sins down on paper, it’s as if the writing forces you to own them.” She’s right. There are times when I’ll be writing in my journal, praying for others (yes, if you’ve asked me to pray for you, your name is in there! ), or asking God for guidance and all of a sudden – Boom! He points out a sin in my life. Somehow, the act of writing down my failures, short-comings, mistakes, or lapses in judgment causes me to see them more honestly. They are no longer dismissive, they are sin. Sins I must own. Sins I committed. Sins I must confess and repent of. Sins that only God can wash away. Oh, don’t get me wrong – there are times when I’ve argued with God, “I don’t want to write that!” And, there have been times when I’ve written, then glued the pages together so that I would never have to see the ugliness of the words ever again! But, oh, how sweet is the forgiveness and cleansing that washes over me. I know that God has taken the sin and thrown it into the depths of the sea. When I see the reality of my sin, I realize how much it cost God to forgive me. When I am forgiven much, I find that I love God much more deeply. My sins may be hurled into the depths of the sea, but my journals are still here! Sometimes I look back through my journals to see how God has answered my prayers. It reminds me of his faithfulness. When I look back and see where I was and how he has brought me to where I am it causes my faith to grow. I know that God will continue to lead me and take me to where he wants me to be. More important than keeping a journal is keeping a clean slate before the Lord. How clean is your slate? How deeply do you love God? Are you taking your confession seriously? When you consider the extent of God’s forgiveness, does your love for God grow exponentially? Guilty. I am the quiet prayer person and you just burst that bubble! Thanks a lot. I may have to defriend you and quit following. Of course I won’t but this one hit the center of the bulls eye with multiple arrows! So sorry, my friend 😀 God is surely gracious to show us the areas where he is at work in our lives, isn’t he?